These cheeky smiley face biscuits are usually vanilla flavoured and filled with the classic butter cream and jam combo. I decided to give them a chocolate almond makeover because I like everything served with chocolate! This is a buttery dough and it will need to chill the dough for at least 2 hours before you start working with it. Once chilled, roll out the dough on a floured surface and use the cutters to press out your smiley faces. Add a further third of the chocolate and stir again until it has melted then repeat this with the remaining chocolate. Leave the ganache to cool before spreading it between the cooled biscuits. 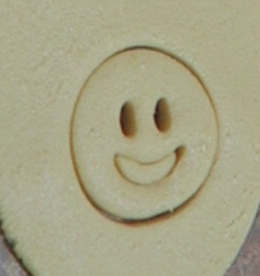 I also made a video review of the Lakeland smiley biscuit cutters that I used to make these biscuits. I sent these cookies to my Food Blogger Cookie swap partners and I received some wonderful biscuits in return from. I also took part in this cookie swap last year.